A few months ago, I found myself with a very happy dilemma. My office computer had reached the end of its useful life and I was given a budget to choose from a range of new Dell laptop and desktops. In the past I’ve typically gone with a desktop to get the maximum horsepower - but these days I would benefit just as much (if not more) with the portability that a laptop can bring. Once I’d confirmed that I could get the performance I needed from a laptop, I hit a tricky decision. Do I get the super-portable (and super cool) 12” machine, or go a bit more practical and opt for the 14”? At my desk, it really doesn’t matter, as the laptop will be docked with two large monitors. This would suggest that the smaller one would be better, as I’ll be more happy to take it with me to meetings and generally lug it up and down the corridors. However, working away from the office might not be so pleasant. Hunching over a 12” laptop stops being fun after a couple of hours or so and I’ll regularly work for hours in one sitting. So, what was my solution? Well, I went for the 12” and used a bit of my own money to mitigate the compromise. 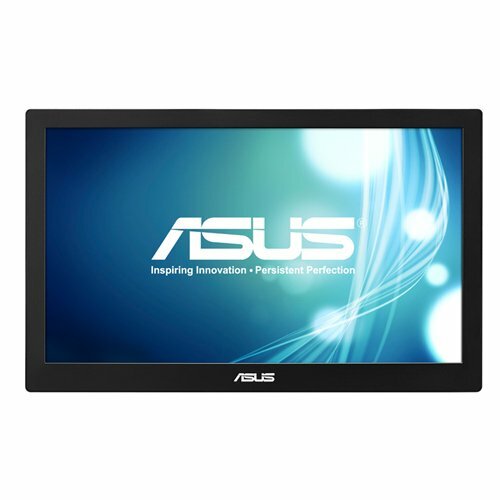 This is the ASUS MB168B+ USB 3.0 monitor. As the name implies, it’s an external monitor that only needs a single USB 3.0 cable to operate! Yes, both power and video are sent over that single lead and you get convenient dual-screen monitors to work on wherever you go. Even better, it has a full 1080p resolution, like my laptop, so images, video and text are nice and sharp. I’ve reviewed these sorts of monitors in the past and really loved them. Back then, due to USB 2 connection speeds, these second screens were better for running your email or a Word document than watching BBC iPlayer, which should be left to the laptop’s own screen. Now, with the power of USB 3.0, that’s no longer a problem and you would not be able to tell this monitor's performance from any typical office computer screen. I even found I could quite happily play games like Portal 2 on it and everything ran smoothly. It’s important that any monitor be conveniently portable, just like the laptop it will be used with. Despite being 15.6” - this attractive metallic (although I think it’s actually a plastic) coated screen is very light indeed at 800g and the case is thin enough not to add too much bulk. Importantly, the case is also sturdy enough to protect the screen during transit. In fact, carrying it round isn’t unlike lugging a normal paper folio and I’ve taken to bringing it to work regularly as it’s such little effort. Asus themselves claim this is the world’s thinnest and lightest and I’m not planning to argue! That case has one last trick up its sleeve too. It acts as the stand for the monitor whilst you’re using it. On a flat surface on a desk, it does the job rather well, but I would suggest anywhere where it can be knocked easily, take extra care as I’m not sure it would take much to knock it over - especially if you fancy seating the monitor vertically. Setting up the screen is easy. Simply connect the USB cable to the laptop and the monitor and things will start to work. For the best control and experience, install the supplied ‘DisplayLink’ software too and these drivers will give you extra options to customise the experience to your preference. The screen itself has minimal controls, with only a brightness and standby button on it. Brightness can also be set to automatic and the screen will attempt to balance itself with local ambient light conditions. An auto-rotate function allows you to easily flip the screen to vertical position, which will please coders. I found the screen to be a big improvement over the Toshiba I reviewed a few years back. This one is bright enough to compete with a normal powered monitor with the LED lighting allowing reasonably accurate colour reproduction and, as I mentioned before, the refresh rate is much quicker than of old. The only compromise I noticed was that this is not an IPS monitor. What this means is you’ll notice the picture start to dim and wash out as you move around it - but sitting dead in front of it (as you would be expected to do) everything looks great. At £150, if you’re planning on buying a monitor for an office, this might be a little expensive compared to traditional monitors. But for the convenience of having something that can be quickly packed away when not needed and can travel with you when you’re out and about - I think it’s a small price to pay for the advantages of dual-screen working (and sneaking in the odd game when you’re not). Recommended.